In 2018, we checked 119 focal plants at 12 remnants for nearby seedlings found in previous years. We found 97 out of the original 955 seedlings (26 fewer than the 123 found last summer). Although challenging to obtain, information about the early stages of E. angustifolia in remnants is critical to understanding the demography of these remnant populations. With still no flowering plants, it is plain to see how long it takes for Echinacea to begin flowering. Between the summers of 2007 and 2013, team Echinacea observed the recruitment of Echinacea angustifolia seedlings around focal plants at 13 different prairie remnants. The locations of these seedlings were mapped relative to each focal plant and the seedlings (now former seedlings) are revisited each year. For each of these former seedlings, we make a record each year updating its status (e.g., basal, not found), rosette count, and leaf lengths. We also try to update the maps, which are kept on paper and passed down through the years, each person using a different color ink. As you can imagine, they are quite colorful & marked up by now. It can be tough to find small plants like this one! Location: East Elk Lake Road, East Riley, East of Town Hall, KJ’s, Loeffler’s Corner, Landfill, Nessman, Riley, Steven’s Approach, South of Golf Course remnants and Staffanson Prairie Preserve. Products: Amy Dykstra used seedling survival data from 2010 and 2011 to model population growth rates as a part of her dissertation. You can read more about the seedling establishment experiment and links to previous flog entries about the experiment on the background page for this experiment. In 2017, we checked 119 focal plants at 12 remnants for nearby seedlings found in previous years. We found 123 out of the original 955 seedlings (25 fewer than the 148 found last fall). 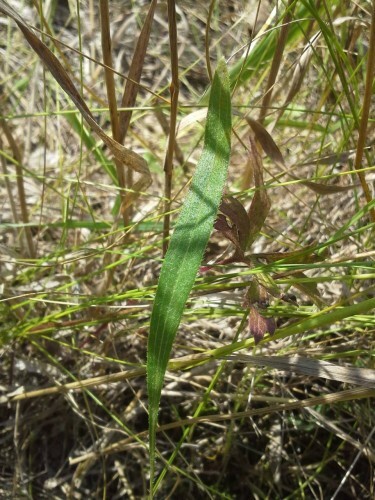 Although challenging to obtain, information about the early stages of E. angustifolia in remnants is valuable. Generations of Echinacea: A fallen head dropped achenes that have germinated. How many seedlings do you see? These data tell us how many years it takes plants to flower (a LONG time!) and the mortality rate for seedlings in remnants. 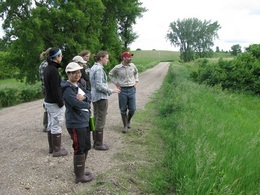 Between the summers of 2007 and 2013, team Echinacea observed the recruitment of Echinacea angustifolia seedlings around focal plants at 13 different prairie remnants. The locations of these seedlings were mapped relative to each focal plant and the seedlings (now former seedlings) are revisited each year. For each of these former seedlings, we make a record each year updating its status (e.g., basal, not found), rosette count, and leaf lengths. We also try to update the maps, which are kept on paper and passed down through the years. 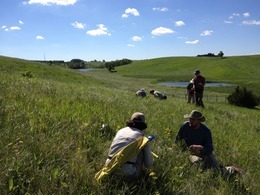 Between the summers of 2007 and 2013, team Echinacea observed the recruitment of Echinacea angustifolia seedlings around focal plants at 13 different prairie remnants. The locations of these seedlings were mapped relative to each focal plant and the seedlings (now former seedlings) are revisited each year. For each of these former seedlings, we make a record each year updating its status (e.g., basal, not found), rosette count, and leaf lengths. We also try to update the maps, which are kept on paper and passed down through the years, and add toothpicks to note useful landmarks when searching. 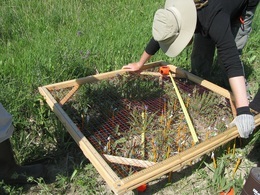 This summer, we checked 119 focal plants at 12 remnants for 239 former seedlings. We found 148 of these former seedlings (out of the original 955). 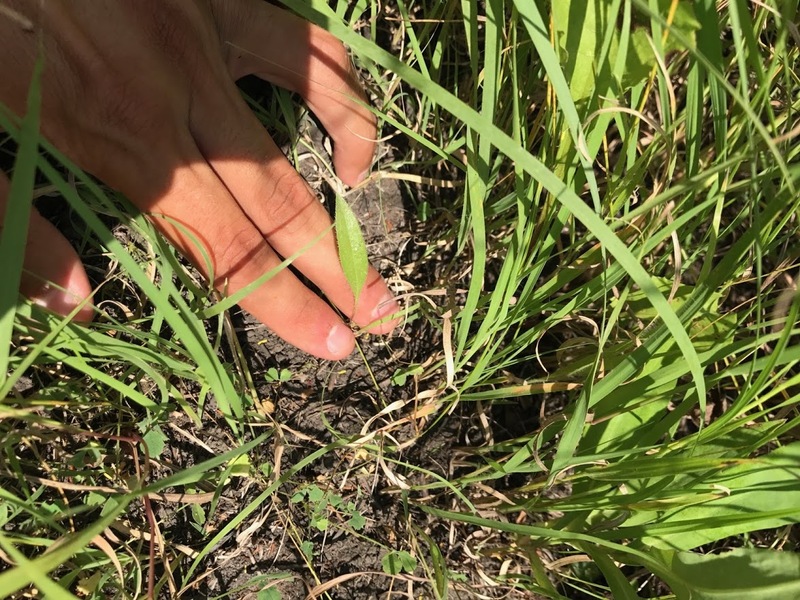 Although challenging to obtain, this data on the early stages of E. angustifolia in remnants is valuable and rare for us, as nearly all of our data from the remnants comes from plants that have already flowered (several years after first establishing). This data can tell us, for example, how long it takes plants to flower, and the mortality rate among seedlings in remnants. Location: East Elk Lake Road, East Riley, East of Town Hall, KJ’s, Loeffler’s Corner, Landfill, Nessman, Riley, Steven’s Aproach, South of Golf Course remnants and Staffanson Prairie Preserve. In 2015, we continued to assess survival and growth of plants that were found as seedlings in the springs of 2007 to 2013. This year we went to 13 sites and 142 parental plants. 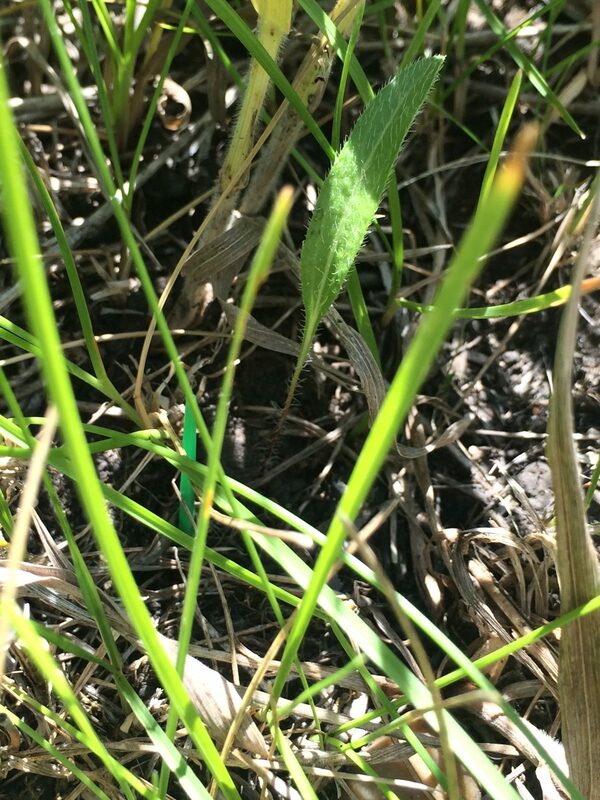 We found a total of 162 former seedlings with 48 of those at the site East Elk Lake Road. At first, the task of reading the maps and triangulating plant positions was hard for the team. We were worried we weren’t going to finish by the end of the field season. But, once we got the hang of it, we sped through with ease. Read other posts about this experiment. Products: Check the flog for preliminary results and annual reports. 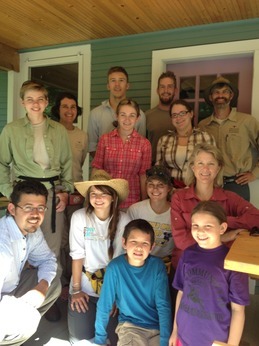 The second week of the 2013 field season for Team Echinacea was excellent. We finished searching for seedlings and found a grand total of 102 seedlings in 13 remnant populations. We laid out the main common garden experiment with over a thousand orange, blue, and lime flags to guide our walking and to enable us to identify individual plants. We also began assessing survival in the recruitment experiment. On Wednesday Ilse presented results to the team on her aster analysis of 17-year fitness records for about 600 Echinacea plants in our main common garden experiment–details to follow. Pam took out her big new photosynthesis machine for its first trial run. Storms and wetness rained us out all day Thursday and we were without power for two hours on Thursday and about 18 hours on Friday. Team members are refining their ideas for independent projects and soon will be able to make their own posts. (IT folks at the UMN said they fixed the access problems-we’ll see.) Stay tuned to read about their awesome experimental plans! Next week we aim to finish assessing survival, flag another experimental plot, measure more plants, work on independent projects, and purchase/make/organize equipment and supplies for our experiments. We are also looking forward to Amy Dykstra’s visit. She will talk about her dissertation research. Searching for seedlings at LF (the landfill site). flowering at the KJ site. The team on the porch of the Hjelm house. First trial of the new phtosynthesis machine. Sorting flags to reuse & recycle. 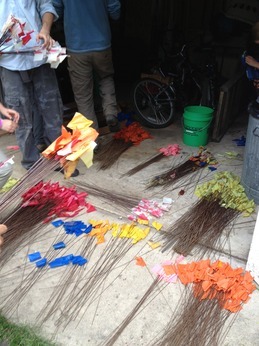 We estimated 2600 flags here to reuse. This afternoon, Amber E. and I (others joined in later) started organizing the data sheets from the seedling searches we have completed so far this season. We are sorting the new maps and other data sheets for each site by focal plant number, and adding the new pages to the end of each site’s notebook. As we organize data sheets for each site, we are also reconciling the maps with the master data sheet for each site. The data we have recorded on the frame data sheets will need to be entered into a spreadsheet, so that we can use the measurements to generate maps and distance matrices for those focal plants. Here’s an Excel file we can use to do the data entry. For each frame data sheet, 2 people should enter the data. The first person will enter data in the DE_1 worksheet, and the second person will enter data in the DE_2 worksheet. The check columns in DE_1 will then allow us to check for data entry errors. The file should be saved as “slingDataEntry2011Page[page number]”. I’ll put together a master list with all the frame data sheet page numbers. The frame data sheets will be in the seedling notebooks. People will enter their initials when they have completed data entry for a page number. Let me know if you have suggestions to make the data entry work better. The seedling search has begun! Today we started the seedling search at Steven’s Approach (SAP). The wind was strong and air temperature was chilly. We searched 3 circles; in one of the circles we found 6 seedlings! We drew a map and filled in a matrix, as we have done in previous years. We also tried out the new coordinate frame. I (Amy) have revised the protocol. Please read it and feel free to suggest ways it can be improved. 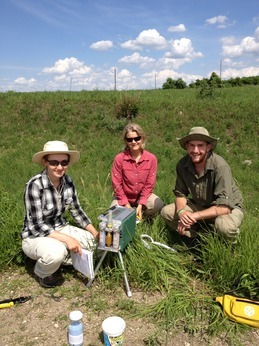 Kate and I have had some beautiful weather for field work (except today–it rained most of the day). Here’s a picture of the roadside site we call East Riley. Notice that our ambitious mower has mowed TWO swaths of the roadside. The mowed area includes most of the circles I am searching to re-find and measure plants we had identified in years past. 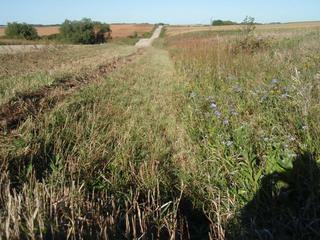 We do seedling searches every spring at 14 prairie remnants. We search within 41 cm (or 50 cm for smaller populations) of randomly selected Echinacea plants that flowered the previous summer. Since 2006 we have used these spring searches to find new seedlings (identifiable by the presence of cotyledons). When we find seedlings, we draw circle maps showing the seedling locations with respect to the focal plant, and make measurements to other tagged plants. In 2009 and 2010 we mapped ALL Echinacea plants within the 41/50-cm radius circles. 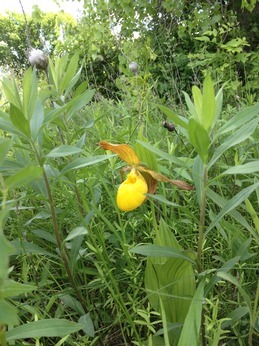 Late in the growing season, we return to the 14 sites and re-find the seedlings and other plants. We update the circle maps, and measure the surviving plants. Why go to all this trouble? I plan to use the data to estimate the growth rate for these small Echinacea populations. Are the Echinacea producing enough offspring to maintain their populations? That’s the question I hope to answer! The re-finds are complete at eelr, lih, nessman, nwlf, randt, sap, sgc and spp. I am currently working at eri; still remaining are eth, kj’s, lc, lf and ri. Some of the sites are disappointing. 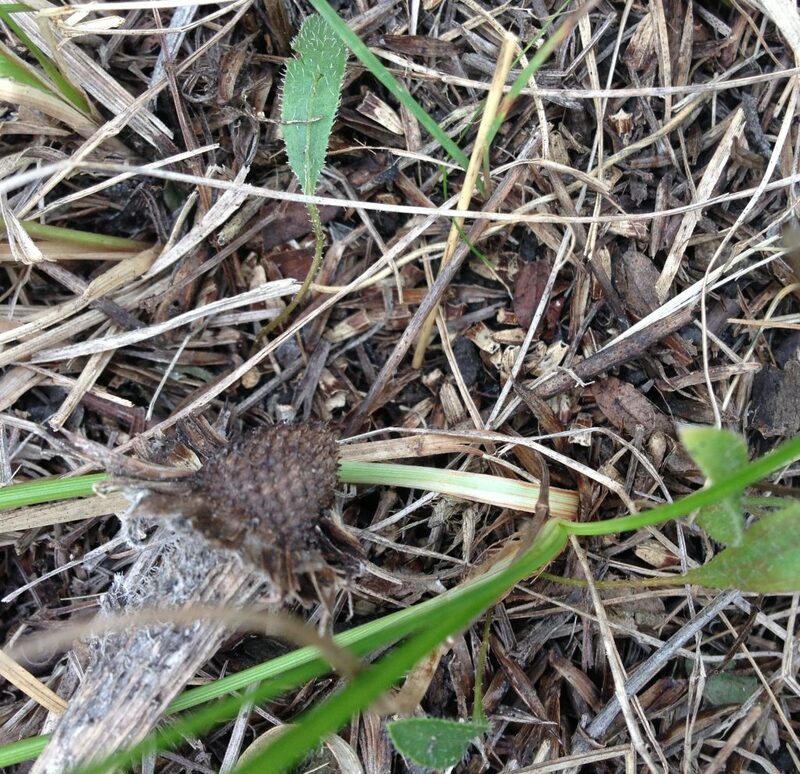 There has been a lot of gopher activity at lih, and most of the Echinacea plants, big and small, are gone. I was only able to find 1 of the 12 seedlings we had previously mapped. Other sites (eri, ri, nessman) are disturbed by frequent roadside mowing and scraping. In spite of that, we were able to find 18 of the 23 previously identified seedlings at nessman. In total (so far), we have found 54/85 seedlings. Some of the survivors were first identified in 2007 (I don’t think I’ve found any 2006 seedlings yet–but there weren’t many to begin with). I’ll post an update when I finish entering all the data…or the next time I get rained out! Here’s the protocol for re-finds in the remnants. Please look it over, and critique!